This course will examine the legal ramifications relating to bullying and harassment issues that educators are exposed to in school environments. Educators in the elementary, middle-school, and high-school settings will gain a better understanding of these complex issues and their own authority and/or limitations. Other social, educational, behavioral, and legal dynamics regarding these issues will be directly addressed. Educators will also review numerous recommendations and action plans for understanding these issues as they apply to school environments. 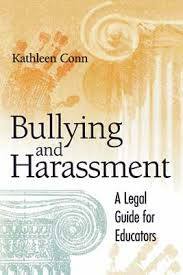 Educators will learn about the legal background associated with school bullying or harassment and their responsibility and authority to address these issues. Teachers will explore other areas of concern, such as sexual or gender-based bullying and other forms that may considered as student harassment in schools. Participants will evaluate how their school and district policies address these problems and what procedures they should and must follow in the reporting process. Participants will examine student threats and violence in schools, and analyze ways to address those issues. They will also look at harassment by adult staff personnel in schools. Educators will learn about the new internet forms of bullying, harassment, and threats that have developed with the use of "Face Book" and other internet forums.